Mini web server that doesn’t need installation and can be used for testing and running browser-based help locally. Can be used to avoid the problem that browsers are increasingly implementing security features that prevent browser-based online help from running properly when opened from local drives or optical media. Free ActiveX control that enhances the capabilities of compiled Microsoft HTML Help systems. In particular, it enables you to use popups, embedded windows, auto-sizing windows, and information types. Small utility to register MS Help 2.x Collections (namespaces, titles, plug-ins, filters) without using Microsoft Installer. Cross-platform GUI front-end to CHM lib (http://www.jedrea.com/chmlib/). Can be used to display CHM files on Unix systems (including content tree, index, full text search, and bookmarks). CHM viewer for Unix, Mac, and Windows. CHM viewer for Windows. Also includes a CHM decompiler. Displays CHM documents on the Mac. Universal document viewer (including CHM and PDF) for KDE. Takes screen captures of a web page in various browsers and on various platforms so that you can verify the rendering. Takes screen captures of a web page in various versions of Internet Explorer. Gives you instant access to various browsers in a virtual machine, or creates screen captures of a web page rendered in various browsers. Lets you set up a specific screen size, and then shows how a web page looks on devices of this size. Shows how a web page looks on various standard screen sizes. Checks the markup of web documents. Free service that checks Cascading Style Sheets (CSS) for conformance to W3C recommendations. Checks internal and external links, style sheets, images, and other files of a web site or browser-based help system. Checks web sites for broken hyperlinks. Link verification is performed on links that appear in <a> tags, as well as images, frames, plug-ins, backgrounds, local image maps, style sheets, scripts, and Java applets. If you create webhelp, you can monitor its use like you can monitor access to any web site. So you don’t necessarily have to use a help authoring tool with built-in monitoring and statistics features. Plugin for Google Analytics and also for Piwik that analyzes how far down users scroll on a page. Provides in-depth analysis that standard web analytic tools don’t provide, such as individual session recordings. Suite of tools to help analyze and improve information architecture and navigation. Price; approx. $166 per months; there is also a free plan with limited features available. War Ihnen dieser Guide nützlich? Hat er Ihnen Zeit gespart gegenüber einer Recherche über Google oder anderen Suchmaschinen? Helfen Sie mit, dass ich den Guide auch in Zukunft kostenlos anbieten und aktuell halten kann. Erwerben Sie die PDF-Version (ca. 120 Seiten). Diese Seite enthält möglicherweise bezahlte, als solche gekennzeichnete Werbeanzeigen. Die verlinkten Webseiten und deren Herausgeber stehen ansonsten in keiner geschäftlichen Beziehung zu indoition Ingenieurbüro für Technische Kommunikation Marc Achtelig und geben nicht dessen Meinung wieder. Copyright verlinkter Inhalte bei deren jeweiligen Rechteinhabern. Beachten Sie die auf den verlinkten Seiten angegebenen Lizenzbedingungen! Mögliche Angaben zu Preisen und Lizenzen auf dieser Seite dienen lediglich der Vorabinformationen und sind ohne Gewähr. Gerne berate und schule ich Sie auch persönlich zum Thema Erstellung und Optimierung Technischer Dokumentation, insbesondere Software-Dokumentation. 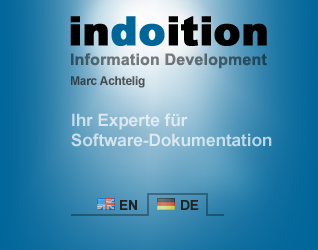 Auf Wunsch erstelle ich für Sie Benutzerhandbücher, Online-Hilfen, Software-Videos sowie alle weiteren Formen an Technischer Dokumentation und Software-User-Assistance.